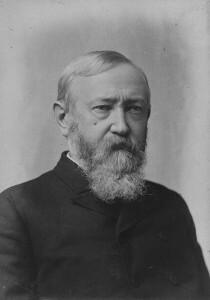 Benjamin Harrison – 1888. Shortly before his election as President. 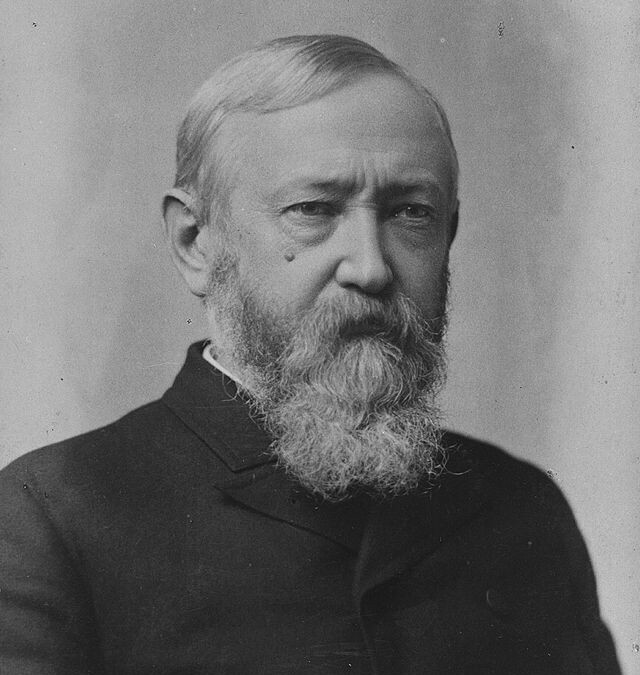 In the election of 1888, Republican Benjamin Harrison evicted Grover Cleveland from the White House, not realizing of course, that he would suffer the same fate in just four years. In the election of 1892, Cleveland made an unprecedented presidential comeback, defeating the short and stiff Harrison and packing him back to Indianapolis. Harrison was sometime derisively referred to as the “human iceberg” for his cold personality. Harrison Installs Electricity in White House: During Harrison’s nondescript term of office, he made one very significant improvement to the President’s House. In the spring of 1891, workers descended upon the house for four months to install electric wires and with it electric lights. Rather than surface mounting the wires and the unsightly view it would create, the workers gouged out valleys in the plaster walls of the historic building, creating a storm of dust. They then proceeded to insert the wires into the newly forged conduits. They were followed by the plasterers and painters who covered up the scarring of the walls. New Technology: Electric lights had been around for just a decade when Harrison made the decision to add them to the existing gas lights that had lit the historic home for close to a century. Thomas Edison had perfected the incandescent bulb and received a patent on it in early 1880. But the technology was still unreliable and crude, and thus the decision was made to retain the gas lights in addition to the new electric lights. And although the President saw fit to get a jump start on the 20th century with the installation of electric lights, he remained deeply suspicious of the new technology. Don’t Touch That Light Switch! He was not only suspicious of electricity, he was deathly afraid of being shocked or electrocuted by coming into contact with this new force of nature. And so from 1891 when electricity first illuminated the White House until Harrison was evicted some two years later, neither the President nor any members of his family put their hand to a light switch – to either turn on or off the power that lit the home. As a result, at times lights on the second floor residence of the president (and his extended family who lived with him) sometimes remained burning throughout the night. Harrison left the risky task of turning lights on and off to the staff of the President’s House, reasoning that it would be far better that a staff member receive the shock of electrical current than the elected president of the United States. I’m continuing to enjoy your blog, Mike. Thanks, Ed! I’m glad you’re enjoying my blog! That’s a great story…thanks for the most interesting post! Thanks, Steve! I’m glad you liked the story about Benjamin Harrison. A very interesting and informative post! I’ve read a fair amount of material regarding our nation’s Presidents, but I was unaware that Benjamin Harrison did anything of note. Perhaps he wasn’t the colorless character I have always assumed him to be. In any event, your blog posts are very well written and are fun to read. Great job, Mike!